We had a real house full last weekend, my sister came home for a visit, The Boyfriend was staying over and my cousin’s two little boys came for a Saturday night sleepover. My Mum made a big batch of lamb koftas for everyone and left the side dishes up to me. With lots of hungry bellies to fill, I was wondering how I was going to keep everyone satisfied and stick within my own calorie limit and without making different things for everyone. On my hunt for tasty low calorie side dishes I started rummaging through my little collection of Good Food and Sainsbury’s magazines. As much as I love cookbooks (and got three new ones for my birthday last week!) I find magazines are probably a better source for more realistic, inexpensive, quick and easy to make recipes for everyday. A recipe from the May issue of Good Food Magazine inspired this dish. 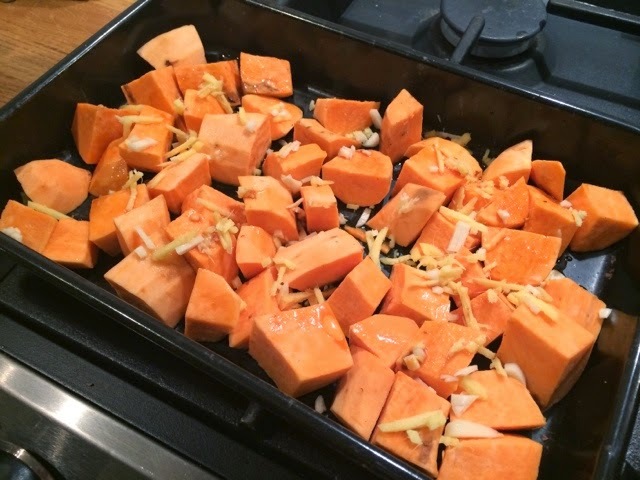 Sweet potatoes are a fantastic alternative to normal potatoes, they’re less heavy and starchy and lower in carbs and calories. 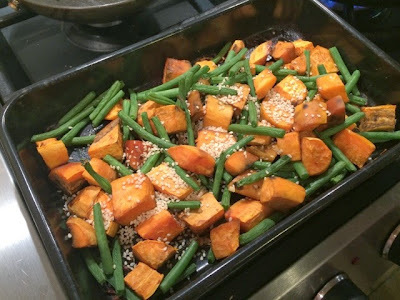 They’re a great lighter way to have carbs, really tasty and mixed up with green beans and some asian flavours in this dish make a great side dish for any sort of meat or fish. 2. In a baking tray mix the sweet potato with the oil, ginger, garlic, soy sauce and fish sauce. Bake in the oven for 20 minutes until the potatoes are softened and slightly golden. 3. 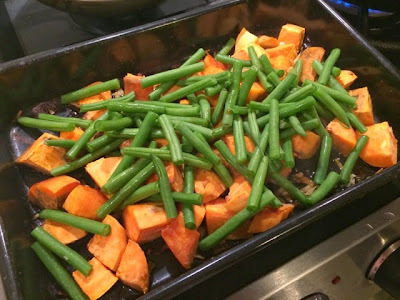 Add the green beans and a splash of water and return to the oven for a further 10 minutes. 4. Scatter with the sesame seeds and you’re ready to serve.